I gained emergency custody of my neice and nephews. We went from a family of 5 to 8 overnight. And, they attended school an hour away. That doesn’t sound like a big deal, until you realize we’re homeschoolers, and I have to get 5 kids and an infant ready and buckled up in carseats and booster seats. And, while my neice and nephew are only riding there and back, Tyler, Rhea and Sunshine are riding in the car from 6:00-8:20 am, 10:00-12pm because my neice has a half day program, and then again from 1:30 to nearly 4pm. I and my 3 children were spending at least 6 hours in the car every Monday through Friday. The kids did amazing considering but, they really needed to run and burn energy and Sunshine needed to be held and comforted and I needed to do laundry, cook, and make stuff for the kids’ homeschooling. I was staying up even later at night and working. I was too busy to sleep and while they slept I was catching up came up with the idea of the Nature Scavenger Hunt List. Why not have something that could help burn some energy, educate them But this scavenger hunt list was a lifesaver especially when I was so tired and couldn’t think of one more entertaining thing to do. It let me simply be in the moment, free and peaceful, while my passion for nature was reawakened and the part of myself that was buried beneath the stresses of adult life burst forth..and then we all held hands and skipped perfectly through the meadows. 😉 But, this let me sit and nurse the baby while the kids played. I sat in a comfy chair, under a tree and nursing Sunshine while I hollered out the “find.” The kids ran around wearing theirself out so they’d fall asleep the moment their wee little heads hit the pillow. Being outside with the kids is simply joyous crazy chaos and I hope you welcome more play and nature into your summer and your life with this Nature Scavenger Hunt List download. ( <– that link’s the download if ya missed it.) It has five pages of “finds” and two pages of “actions” to take while you’re finding things. I included some fill in your owns too. After all maybe you want to hula hoop while you look for a frog! 😉 There’s over 4,000 ideas here! That’s an entire summer of stuff to do. There are over 4,000 ideas here. 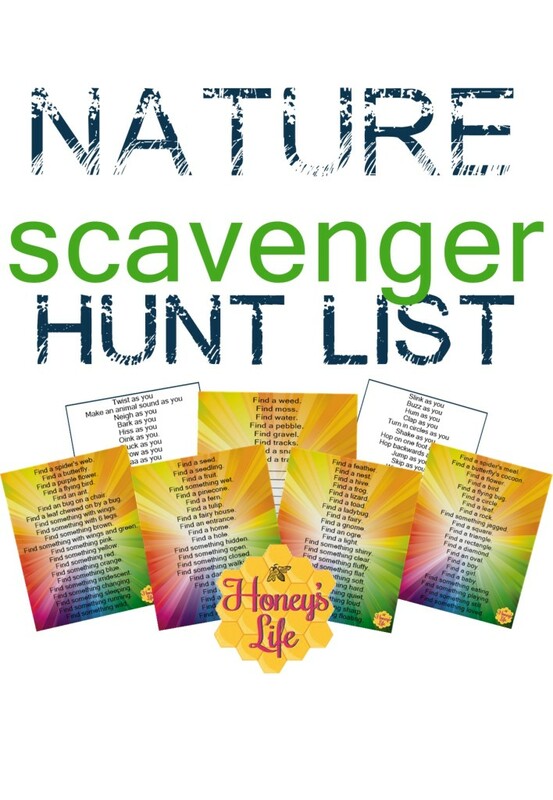 That’s an entire summer of Nature Scavenger Hunts! put in writing this blog. I’m hoping to check out the same high-grade content from you later on as well. This is great! Thanks so much for sharing. We go camping often and this is a fun idea to do with the kids. I’m going to print them and laminate them, just as you said. I’ll store them with our camping stuff, but I’m also going to keep an extra copy for the summer when all the cousins hang out at our house. On another note, I wanted to mention that a good friend of mine also had the same experience you did of having emergency temporary custody of her niece and nephew. Lucky for her, their school was only a few blocks away. Wow! I cannot imagine all the work you had of chauffeuring all the kids around. It was exhausting just to read. My friend has 5 kids, plus the 2 made 7! Something that really helped her out during this time is the curriculum Time4Learning. The kids were able to do their schoolwork at their own pace. And because she didn’t have to do lesson planning and the record keeping was done by the program, it freed her up to serve her family in other ways, especially just being with them. Dude you have no clue how your comment made my day Janet! 🙂 I’m tickled pink you’re making 2 copies! Camping would be an awesome place for these too! I’d love to see a pic of ya’ll using them! Holler if you post about using them while camping or using them anytime! Thanks for sharing this post at Mom’s Library. I have featured this post on Pounds4Pennies this week. Stop by to share more great summer activities this week! I love this scavenger hunt. We can never get enough outdoor time! I am pinning this for future reference. What a great resource! Thank you for sharing!! I am featuring it at our Kids Learning Printable Linky Party with Free Science Printables!